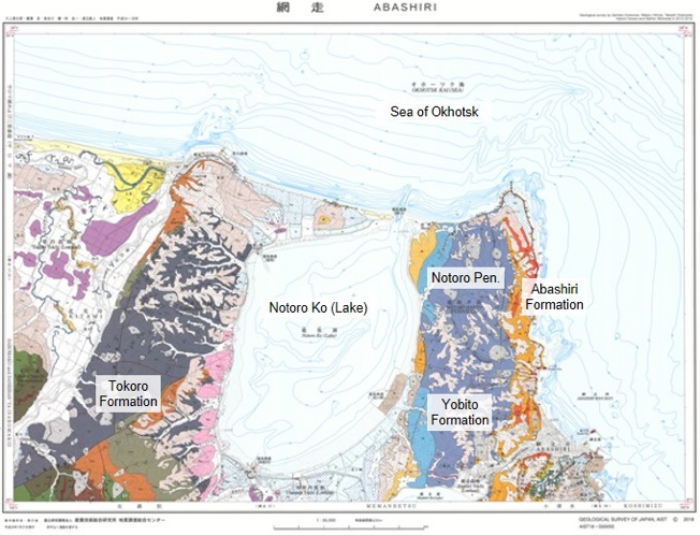 The Geological Survey of Hokkaido, the Geological Survey of Japan (GSJ), and Ibaraki University conducted detailed geological surveys in Abashiri district from 2011 to 2017, and compiled the results as the 1:50,000 quadrangle geological map of “Abashiri” (authors: Gentaro Kawakami1), Wataru Hirose1), Keiichi Hayashi2), Ken Hasegawa1), and Mahito Watanabe3)). The map has been published by GSJ on July 27, 2018. 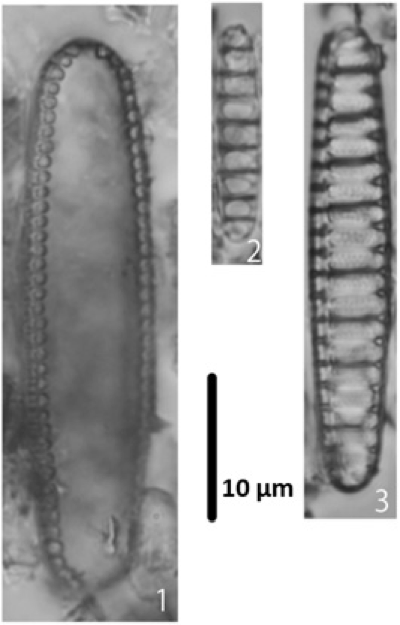 This time, depositional age of muddy sediments is re-examined based on the detailed study of diatoms and dinoflagellates fossils leading to the significant revision of the local stratigraphic division. These microfossils will improve the accuracy of geological maps in the area, which have not been updated since the 1970s. The publication will trigger a large-scale review of the geological history in eastern Hokkaido. A number of geologically interesting outcrops are also found in the survey. They can be precious resources for tourism including development of a geotour. Fig. 2. Diatom fossils in the mudstone formations in the Abashiri district. Denticulopsis dimorpha var. dimorpha (Schrader) Simonsenm (About 9.3 to 10 Ma) from Masuura Formation. Denticulopsis simonsenii Yanagisawa et Akiba (About 8.7 to 14.5 Ma) from Masuura Formation. The map is available from commission agents since August 10, 2018. For details, see the URL below.